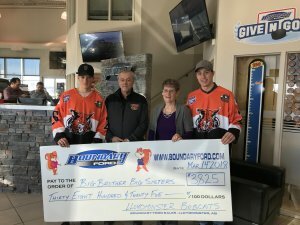 A huge thank you from Big Brothers Big Sisters to the Lloydminster Bobcats and Boundary Ford with their Give N Goal campaign! Boundary Ford and the Bobcats were able to present a $3,825 donation to Big Brothers Big Sisters of Lloydminster! For each goal the Cats scored this season, Boundary donated $25 to a charity of the player’s choice.